Angel Paintings & Clairvoyant Readings, Lancashire..Read My Wonderful Comments! 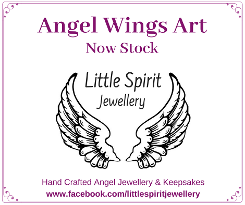 "Hi Jayne its Franci here saying thank u for the lovely Angel card"...."Take care Jayne and Thank You once again"
"I just wanted to say how delighted I am with all the fantastic items that I bought for my daughters Christening. I looked at dozens of other web sites, and none of them had anything that matched the level of quality you provide. The painting is perfect and a wonderful personal touch. Utterly delighted with the Angel key rings. They really are beautiful. You have really helped to make this a very special occasion. Alexandra House Health Spa, Edgerton, Huddersfield. A stunning holistic health spa with many treatments, retreat packages and products! Heber Street Spiritualist Church A very warm welcome is extended to all who attend services. Take a look to see a full list of speakers & events. This website includes links to other Websites owned and operated by Third Parties. I have no control over the content of Third Party Websites, and Angel Wings Art accepts no responsibility for them or for any loss or damage that may arise from your use of them. Angel Wings Art® 2011-19. All images copyright of Artist Jayne Tunney.